Advent calendars have only been around for 100 years or so. 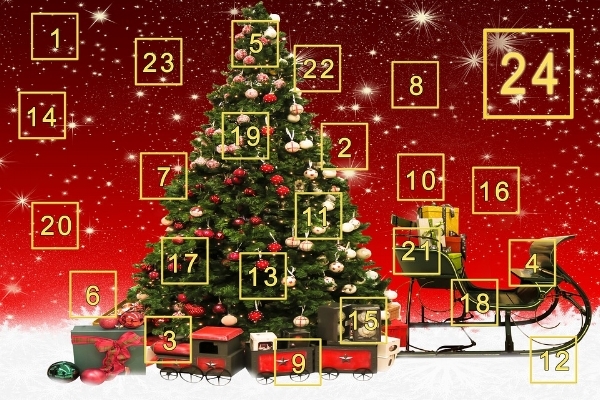 They were designed to build anticipation for Christmas, and as the years have gone by advent calendars have become more and more elaborate, beginning as windows with only pictures behind them, to extensive chests with new toys behind each window! You could probably argue that the evolution of advent calendars has tracked the ‘commercialisation’ of Christmas: for many, it has become no more than a break from work to share time with family and friends and to exchange gifts; the birth of Jesus is almost irrelevant. But at its heart, Advent contains a wonderful truth. We tend to think that it's about the coming of Christmas, and our Advent calendars mark off the days as we are waiting - perhaps even longing - for Christmas Day. But in fact, in the church calendar, Advent (which means ‘coming’) is not primarily about the first coming of Christ, it's about his Second Coming “in a cloud, with power and great glory” (Luke 21:27). The work of Jesus was only beginning at his birth: it was his life of service, death of obedience, and resurrection to glory that accomplished his mission. And Advent reminds us that we are waiting, watching and longing for Jesus to return to the earth, not as a baby in a manger this time, but as King. So, as we wait, I wonder how many doors do we have to open before Jesus’ second advent? We don’t know, but let’s hope it’s not too many because the world certainly needs him and the kingdom of peace and righteousness that he will bring. As the angel Gabriel said to Mary, “You will give birth to a son … he will reign over the house of Jacob for ever; his kingdom will never end.” (Luke 1:31-33). What a wonderful future to look forward to!